For those folk still oblivious to Secateurs: who are you and what do you do? We’re a three-piece rock band, who enjoy playing music that’s inevitably too loud for us, and everyone involved. Since you were featured as Gigslutz Unsigned Act of the Week last January, how much has the band matured? Has anything changed regarding the group’s direction, sound or aspirations? Jay has grown his hair long, much to the delight of Gaz. Gaz has become increasingly difficult to work with, insisting that seminal German trance act Fragma become the band’s main influence. And Taylor can no longer enjoy himself without the aid of Fisherman’s Friends. But our aspirations remain the same: to use the band as a platform to determine whether there really is a more exciting, yet exasperating ideal than this thing we call rock ‘n’ roll. Boys, you’re set to return to music in 2015 armed with a brand-new EP. Can you reveal any details surrounding the release exclusively for Gigslutz? It’s called Streak EP, and it’ll be released on the 17th April, the first day of our 13-date UK tour. It was recorded with our friend Josh Davies of Thistledown Recordings. We used an abandoned house, with no running water and barely any electricity as our studio. Just to make things interesting. The EP will be available to pre-order at www.secateurs.bandcamp.com, and we’ll have physical copies at all of our shows. If any of our readers were debating whether to catch you live on your just-announced UK tour, what can they expect? Three slightly annoyed North-Walian blokes making a racket. Possibly David Cameron on stage in drag… Don’t hold us to that. Has there been a defining moment in the band’s lifetime where you’ve stood back and realised how big you could actually become? We’re not suffering from any delusions of grandeur. It’s a big pond, with lots of little fishes. We might end up a shark one day, we might not. That’s how we view it, even when we tell everyone we’re gonna’ be massive. What are the secrets behind Secateurs’ music writing? Does it resemble a joint Morrissey-and-Marr effort or a one-man-one-army style? Anything goes. Whether it be a riff, a bassline, a beat, or just a sound. Something starts something off, and that sometimes becomes a song. If you were to curate your dream headline show, where would the gig be held and who would be on the bill? Such an event would take place at The Castle Inn pub (aka “Hendies”) in Shotton, and we wouldn’t headline. We’d warm up the crowd for ‘Spoon Man’, a local legend who has a remarkable knack for ‘titting-about with the some spoons. It’s a real joy to behold. By this time next year, where do you hope to find Secateurs? On Soccer AMs 2016 dance-off. Gaz’s spin move is a real showstopper. 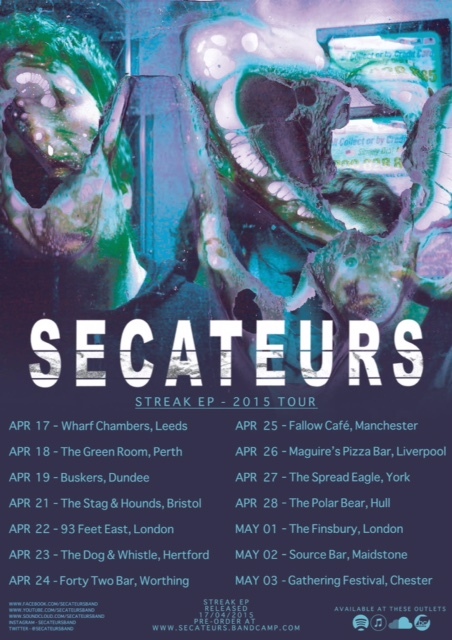 With festivals across the land building up their stellar bills, can we expect to see Secateurs’ name residing on any line-up posters in 2015? Who knows? A few people seem to be into us, our mates and our mums and dads and that. Those few need to turn into many before anyone can expect to see our name in lights. And finally lads, if you could give one piece of advice to yourselves when you were just starting out as the group, what would it be and why? Listen to more Fragma, for obvious reasons.